Although this website is centered around quality pest control companies specializing in treating bed bugs, we also show you how to get rid of them yourself while avoiding common mistakes most do it yourself'ers make. We show you how to perform your own bed bug treatment, but many times those with infestations just don’t have two months necessary to properly eliminate these bugs. If that’s your situation, or you’re just plain tired of being bitten, then you should read our page on "how to get rid of bed bugs"; not all pest control companies can handle bed bugs and we’ve gone the extra mile to list the ones that do. 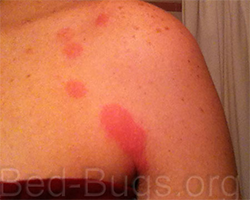 Here are pictures of the damage bed bugs can do, from the bites to your body right up to infesting your home; the cost for a pest control company to exterminate the infestation below was $1,400 and took over a month to complete. There are a couple of mistakes that homeowners often make when they discover they have an infestation. Most common is spraying insecticide or using a bedbug bomb! Such actions usually cause the bugs to find another hiding place or move to an adjacent room (or apartment!). Foggers and sprays can also be very harmful to children, adults and pets; remember, these insecticides aren't really meant for use on bedding, linens, carpets, etc. You could be creating a whole new problem worse than a few bedbug bites. The second most common mistake is to move yourself and cloths into a friends house which only results in your friend needing their own pest control down the road! When entering premises avoid setting coats, bags, purses etc. on beds, floors and against walls. Check your vehicles before sitting to detect any bed bugs. Do regular inspections of all areas bed bugs like to hide. In bedding, in & around bed frames, on stuffed animals (Stuffed toys can be put in the clothes dryer for 40 to 60 minutes) and decorative pillows, inside clothing drawers, around baseboards and inside slots, screw holes, cracks, & crevices in around furniture. Be vigilant in checking these known bed bug hideouts. When you become aware of a bed bug infestation, it is time to go through all your belongings & throw away all your clutter. 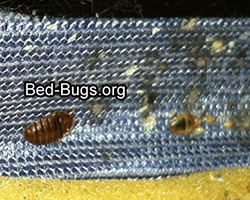 Cluttered conditions can offer the bed bugs a lot of excellent hiding places very near their human blood-meal hosts. Do not forget to throw things out in sealed plastic bags or wrapped in plastic so you are not dropping & spreading the infestation as you discard them. Thoroughly de-clutter and clean all areas (bedding, couches, bed frames etc.) where you have been bitten by bed bugs. Do not dispose of furniture or mattresses that have had bed bugs in them by trying to sell them to other people. Although the items might appear to be free of bed bugs, more could be hiding and you would unknowingly spread the bed bug problem to others. When removing sheets always carefully roll them off instead of pulling or yanking them off. Pulling causes the removal of any eggs and bed bugs attached to them. Vacuum up any visible bed bugs & eggs. Always put clean white or light colored sheets on bed. Light colors make bed bugs easier to detect. Wash all bedding and clothes in the hottest water possible (at least 120 degrees Fahrenheit). Use a hot tumble drier at the hottest setting possible. Research has shown bed bugs can possibly live through the washing but the hot dryer will kill them. Try to avoid using diatomaceous earth. Although it is sold as a safe natural product, if you must use it, be very careful to follow all instructions and wear a proper mask. While it is safe enough to eat, it is very bad for the lungs and we have been to so many homes lately that were covered in this dust, their couches, carpets, counters. This is ONLY meant for under baseboards, cracks, crevices, electric outlets etc. where it cannot be stirred up into the air. If possible, try to capture 1 or more bed bugs in a vial, pill bottle or in a baggie (taped shut) so you can get a positive identification of bed bugs from your pest control person. A good way to tell approximately how many bed bugs are invading your home is by the bites. If you have 50 bites there are approx. 17 bed bugs or 3 bites per bed bug. These tips should help you reduce your bites & minimize the spread of bugs until you can get a professional bedbug exterminator to treat your home. What do visitors have to say about bed bugs? I found one on my couch. My sister has an infestation and I’m usually diligent but my other sister has been coming over after visiting her house. I called a bedbug exterminator even though I could find no other signs and I vacuumed and washed everything. Don’t take chance for them to take over; don’t let them breed! Call the professionals it should be priority number one MAKE IT HAPPEN! Home treatments are too risky! I have bedbugs for more than 6 months now and at first i could not understand what’s going on. I would wake up from a strong itching and after that it would be very hard to fall asleep again. My friend told me that these bedbugs have some sort of 'anesthesia’ so that when they bite you, you can’t feel the itch or bite immediately, so they have time to leave or hide in a mattress or elsewhere. But why the heck nobody is questioning: Why these things are forced upon me? I live in Utah and I had never seen a Bed Bug till about a month ago ..... I moved into some apartment and my neighbors upstairs have them bad but they don’t seem to mind cuz they are doing nothing to get rid of them i have had a professional come out and spray my apartment after i caught one biting me on the neck. Having bedbugs is indeed a nightmare. My advice after trying to get rid of them yourself is DON’T! Call an exterminator immediately. I tried all of the self-treatments, spraying, washing, food grade diatomaceous earth and they will not work! Don’t waste your time or your money. Get a professional exterminator to come to your house or apartment immediately. I just went through my first treatment. They had me bag my clothing and most items that were in my dresser but left my kitchen and bathroom pretty much unbagged. Then they had me leave a few hours while they did the treatment. I think I noticed a nymph (baby) a couple of days later but I understand that it takes 19 hours or longer for them to die and then often they will leave hatchlings behind and a second treatment may be necessary. I have had to by three blankets so far not because I necessarily needed to but because I have been freaked out by this whole situation. When the exterminator came he showed me the cracks where in the mattress and box springs where the bedbugs like to hand out and I hadn’t realized there were so many of them. He then provided me with two mattress covers, the ones that have a locked zipper on them so that there is no hole near the zipper where they can get into. So we covered the mattress and box springs to prevent any bed bugs to get into the mattress any longer. He suggested getting a blanket or bedspread that doesn’t rub against the floor, but with the way I sleep mine always ends up on the floor which is making me worry. When you are getting your treatment take your clothing that you have in bags and leave them in your bathroom and only open up the bags when you need to get some clothing to wear. If you are done wearing the clothing put those in a separate bag. I think i freaked out this morning because i saw a rash on my skin but I belive it’s due to the material on my new blanket which is rather rough and I have sensitive skin and it does not look like the awful red bug bites I had before thank goodness but I want you to know you are not alone and that this has been a mental nightmare constantly worrying and having to check things and wondering if you are doing the right things and wanting to never see those things again! My biggest advice is don’t do it yourself! Get an exterminator out immediately and ask lots of questions. Do not trust in sprays or DE or anything else. The bugs are too tough and smart for those things. sleep with the lights on and no covers. record the area with a cheap video camera set on a timer and night infrared, you will see where they are coming from and how they feed. and yes; some came down from my hair. I pulled one out of my lower back as well. it was 1/4 long and black with more of a elongated look. the proboscis (two) were about as long as the body. home depot verified it; collect evidence or people will want to commit you. i have wasted 4 months, $$$$, etc. and these things will not die. you are definitely in for a fight. i dealt with beg bugs for two years... please read this it WILL help you. i first got them when i lived in an apartment complex (the guy upstairs brought them in) after two months of h*ll i moved. i threw everything away. i thought i was free, but apparently the house was more infested with bed bugs than the apartment. after 10 months of that i moved again. this time when i saw them again i knew i must have brought them with me. i was out of money so i couldn’t move. KEEP YOUR MATTRESS. why? because that’s where you sleep and they will be attracted to it. so essentially you will be baiting them out. next: do this daily or every few days or weekly depending on your level of infestation, take alcohol and put it in a squirt bottle. put your mattress upright against the wall or have someone (not a child) hold it. spray part of the mattress where you can see poop/bugs. don’t do a big area cuz alcohol dries quick. take a freeze stick, use a long one cuz you’ll freeze your fingers (trust me i know), and freeze the mattress for a few seconds. Keep doing it till you have done all parts. if you smell a nasty stench, embrace it. that means you are successful. TURN UP YOUR WATER HEATER TO THE MAX!!!! when you wash your stuff the water will be super hot and they will die. if the washer doesn’t get them, the dryer will. dry clothes for 2 cycles. it works. i triumphantly plucked dead bed bugs out of my lint catcher. if you see any bugs anywhere in the house, do not smash them! bed bugs can reproduce like crazy. anywhere there is a bug you have to assume that there is eggs underneath or beside them. Freeze the bug and the area around them exception: if a bug is crawling on the carpet just kill it. they like to be up against something when they pop out kids. pull off your base boards and check under the carpet. at the second house we lived at my boyfriend happened to catch them pouring out of the base boards. if this seems too much for you to do, you can always call one of those places that will heat your house to like 120+ degrees and that will work. (i know someone who owns houses and when renters leave he uses that method) it is expensive and i am poor so i couldn’t do it. take everything on the floor and but it on top of something. OR put it in a box or bag and put it in the basement or a storage unit. i had all my clothes in suitcases in the basement. bed bugs will only reside where humans are. so if you don’t spend lots of time in the basement the stuff will be safe there. do not put anything that has bed bugs or that hasn’t been checked in the "safe place". i made that mistake as well and had to throw away stuff in my storage unit. i know how frustrating this can be. i broke down sobbing to my mom on the phone many times. i also know of that paranoia this can create. every time i see a bug or a black spot on the wall my heart jumps cuz i think its a bed bug. this is a hard process but freezing works if you keep doing it. also, don’t be afraid to throw things away. i threw out books, clothes that were destroyed by bedbug poop, a bookshelf, my couches, my first bed (i figured out the "bait" thing at the next place) and my piano cuz i didn’t know how to get it apart and i was paranoid they were hiding in it. I’ve been bed bug free for over a year. so i know the freeze stick works. best of luck! I am not really sure where we may have picked up bedbugs, but because of a few friends’ hotel experiences of being bitten, my knowledge of these nasty pests helped me diagnose bites on myself. The exterminator that I hired said we probably had a very minor case and to this day, I have not seen one in my home. I started out having bites that were extremely itchy and the more I scratched, the more irritated and larger the bites became. As days went by, I would get more bites, some larger than others! I searched everywhere for bedbugs and could not find any! I finally after driving my husband and kids batty, convinced them that I the only explanation was bedbugs and hired an exterminator. The exterminator looked at my bites and their pattern and identified them as bedbug bites, because he has seen so many! Funny thing was I had to get an employee physical and did show the bites to my physician and he said they were not bedbug bites, but I doubt he really had ever really seen any! I had my whole home, 3500 square feet treated! After the treatment, a week went by without bites, which the exterminator was honest and said he would probably have to come back to treat it again! I sleep on the couch and I made sure I slept there and did not go to another room so I could determine if I was still being bitten, since I was the only one with bites....the second treatment took two weeks before bites showed up again... After the third spraying, I have not had anymore bites, but I still check myself and get a little paranoid if I have an itch! These bites are probably the worst itching I have ever experienced! It has been several months since I have received any bites but I know we are not out of the woods yet! I have a touch of OCD and vanpool for bedbugs for hours on my house... To this day I have not seen one in my home! BUT the bites have stopped after three treatments! One thing I did notice was that I had all different sizes of bites from different stages of the bedbugs and my exterminator said that is very common! Horrible experience and I was very thankful that I was the only one that this affected in my home, even though I drove my family nuts! I woke up Saturday morning with a few bites on me. Two on the upper part of my left arm and three on my right shoulder blade. They were reed and itchy but no uncontrollably itchy. I really didn't even know they were there anymore after a few hours. My husband had no bites on him and I have yet to get anymore bites since then. The ones on my back were more in a group of an upside down V. My sister who suffered from a huge infestation of bed bugs looked at the bites and said she believed that's not what they were. We also tore my bed apart looked and found nothing. Having terminix come out today to inspect. Does this sound like bed bugs? i just threw my new couch out side in -5 DEGREE weather at nite i know this will not kill the bugs my question is how big is the smallest one? is it visible to the naked eye? my daughter came home a few months ago with bites and then her friend stayed all of a sudden i was infested took direct steam heat and rest easy to couch helped for maybe a week, the ironic thing is my couch is new yet the beds eight years old and no signs of them anywhere but couch! So, my solution is to get rid of it. i just want to know i'm not missing any some people say u cant see them well i've seen big and small just want to know how small so i can be assured they no longer infest my living room the new couch is not worth the anxiety and gross felling i got sitting on it, and my daughter is no longer allowed to go over to their house, and her friend is definitely not coming to mine. Her mom tried to convince me they were gone then again my eight year old had bites from their home and every room is infested. I feel bad but i just paid that couch off now its off to the dump people told me to sell it my morals wouldn't let me as so many people don't care what they send to others homes knowing the bad infestation it brings. the cold wont even kill this little suckers so buyers beware! i will never buy a couch used, and if new it will still be in plastic wrap. If the law didn't prevent me from doing so mine would be ashes as of now and if you have sold a piece of furniture with suspected bugs shame on you that's why our infestation has worsened in the past few years. i'm a struggling single mom with no furniture in living room now but at least i know my bugs wont infest others and their neighbors, friends and family. money and material things are not everything and my eight year old has just taken this so well! Here in Alaska they come out all hours of the day due to lack of sunlight i believe and I've seen three in one night, that was the final straw, i got up and tossed it out my door section by section and i think my paranoid conscious is keeping me itching with no bites. It's been three days now hoping for best or i'm buying plastic blow up beds for room till this is resolved hope the best for everyone fighting this bedbugs my solution to you get rid of the furniture they are in before they end up in everything. Moral of my story is don't buy used furniture!